Label Free Intrinsic Imaging (LFII®) analysis was carried out on the monoclonal antibodies Infliximab and Rituximab for the assessment of stability, fragmentation and charge heterogeneity. This work was performed as part of a study for the UK’s National HealthService (NHS) using a deltaDOT HPCE-512TC Capillary Electrophoresis instrument. Quantifiable differences were observed in the samples before and after heat-stress. Excellent repeatability was also obtained with a peak area Relative Standard Deviation (RSD) of 2.9% and a migration time RSD of 2.3%. mAb samples were diluted to a concentration of 0.5mg/ml in CGE sample buffer and run under reducing and non-reducing conditions. The reduced samples were treated with β-mercaptoethanol and heated at 70°C for 10 minutes. The non-reduced samples were heated at 70°C for 10 minutes with no reductant. The electropherograms below show the excellent separation of the liberated heavy and light chains achieved in 20 min. Several minor components were also resolved. Figure 1. Electropherograms of Rituximab reference (stock) and test (saline drip) samples under reducing conditions. The expansion shows minor components present in the samples and demonstrates the power of the signal processing to resolve all peaks present including small ones close to much larger peaks. Without this ability, product quality could not be properly assessed. Without prior reduction of the disulphide bridges, the intact mAb is resolved from a number of other components. Figure 2. Electropherograms of Rituximab reference (stock) and test (saline drip) samples under non-reducing conditions. Peak 7 is the intact peak. Table 2. % of intact mAb compared to other species present in the (a) reference and (b) test samples. CZE (or free solution CE) was used to assess the charge heterogeneity of Infliximab which can reveal differences in post-translational modification. Significant differences were observed between the control samples and the stressed samples at the temperatures tested. These changes could potentially lead to major differences in the efficacy of the drug product. Figure 3. 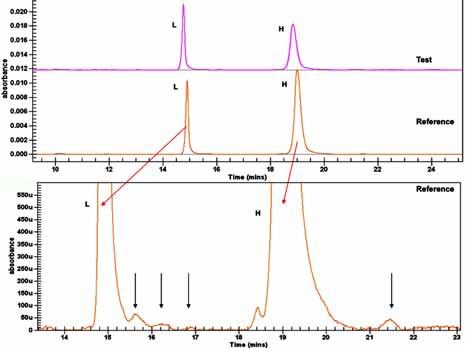 GST electropherogram showing the separation of the Infliximab sample stored at 2-8°C and the sample stored at 40°C for a prolonged period. The main peak is marked with an asterisk. To see what HPCE can do to solve your analytical challenges, please contact me on mark@discoveryanalyticalconsulting.com for a sample submission form plus a full list of what's available at deltaDOT.